Region: In the heart of Ojai village. Leave the ordinary world behind....come to Su Nido. Peaceful suites await you with artful Mission Revival decor, fireplaces, kitchens, private patios, luxurious linens, Molton Brown of London toiletries, and other amenities for your comfort and entertainment. Relax and refresh in your own private world, lounge in the picturesque courtyard (you may never want to leave) OR embrace the unique flavor of the Ojai village just steps away; stroll the Arcade, art galleries, and Libbey bowl park; enjoy nearby golf, tennis, hiking trails, and bike paths. Boutique shopping and fine dining abound. $189 to 479 per night. Spa packages and gym access are available. Su Nido was designed not just as a place to stay but as an oasis experience for you, an escape from the ordinary: hence the name, which means 'your nest' in Spanish. Located in the heart of the colorful Ojai village, you're still 'tucked away', your privacy assured. Pamper yourself with the luxuries our suites have to offer: feather beds, fine imported linens, a fireplace, soaking tub accented with mosaic art, Molton Brown of London body therapies. Or enjoy the fresh air and sunshine from your private patio or deck. 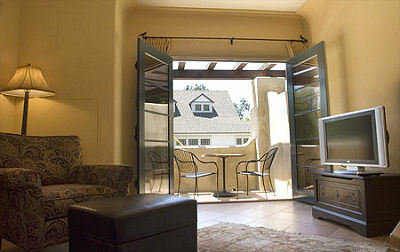 This and other Ojai Bed and Breakfast Inns can be found here online in The Register.